Heroin has long been the drug of choice among users in Vietnam, mostly older men, but synthetic drugs use is on the rise especially among a growing class of hard-partying youth. The sentences handed down Friday were among the toughest in years and came after a four-long trial in northern Ha Nam province. 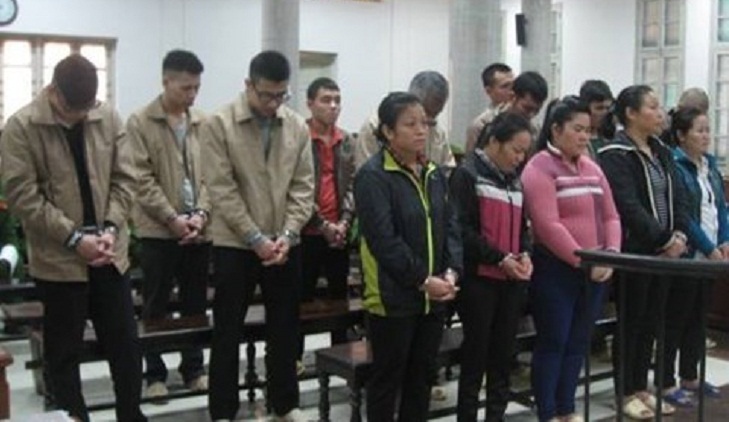 The ring leaders were convicted for trading 18.5 kilograms (40 pounds) of heroin and and 563 grams of methamphetamine in northern Vietnam, according to the state-run Vietnam news agency. Three others were given life in prison, and 10 others were sentenced to between seven to 21 years in jail in connection with the drug ring. "The investigation showed that 22 defendants had illegally traded drugs many times," Ha Nam people's court said on its website. Separately, four men were also sentenced to death in northeastern Cao Bang province on Friday for dealing heroin, state media reported. Communist Vietnam has long vowed to tackle "social vices" including drug use, which is prevalent throughout the country. It has some of the harshest punishments in the world, and anyone caught with more than 600 grams (21 ounces) of heroin or more than 20 kilograms of opium can be sentenced to death. Authorities have struggled to contain a growing trend among youth for synthetic drugs such as Ecstasy, methamphetamines or Ketamine. Seven people died after using drugs at an electronic music festival in September in Hanoi, a buttoned-up capital with a reputation for being conservative. Many of the synthetic drugs on the market in Vietnam come from the notorious Golden Triangle region, a lawless borderland region covering parts of Thailand, Myanmar and Lao.